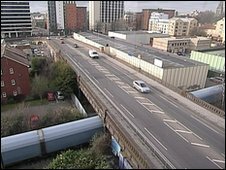 One of the busiest routes for motorists into Southampton is being closed for a year for repairs from Sunday night. Central Bridge, a listed structure which is starting to crumble, brings drivers into the city centre from the east, after crossing the Itchen Bridge. It used to span several rail tracks before the main railway station was moved more than one mile away (1.6km). Drivers will be diverted into the city past Ocean Village or St Mary's stadium in Northam. It will reopen in 2011. Gary Gaskarth, of Network Rail, said: "What we're going to be doing is stripping it down to its bare bones in order to strengthen and repair the metalwork and the brickwork. "And then we're also going to be putting it back together."